In the Summer of 329 B.C., Alexander was shot in the leg by an arrow during offensive operations against a 20,000 strong native armed force (Curtius VII.6.2-3) in Sogdia. The dart broke his fibula (Arrian III.30) leaving him unable to walk. Afterwards, members of the Macedonian cavalry and infantry argued over who should be given the honour of carrying their king in his litter (Curtius VII.6.8-9). Both felt it was their right to do so. In the end, Alexander defused the increasingly tense situation by declaring that both cavalry and infantry would be permitted to carry him – on alternate days (ibid). This dispute highlighted both how deeply the mounted and foot soldiers loved their king and the rights that they believed they had in relation to him. It also portended the first struggle after Alexander’s death. On 11th June 323 B.C. 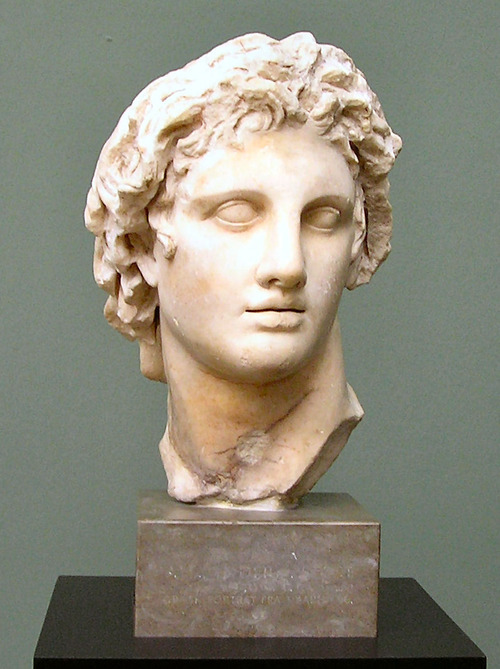 Alexander died without an heir. Roxane was pregnant but, for all anyone knew, her child might turn out to be a girl. In the hours and days that followed, the phalanx – the most senior members of the infantry – took the logical but controversial step of declaring Alexander’s half-brother, Arrhidaeus, as king. The reason why their declaration was controversial was two-fold. Firstly, they had acted unilaterally. The army had the right to elect its king but my understanding is that this meant the whole army. Secondly, Arrhidaeus suffered from a mental or physical disability, which was serious enough to render him unfit to be king. Had it been otherwise, Alexander would have had him killed in 336. The reason why the phalanx still chose Arrhidaeus is because they wanted –needed – to be ruled by an Argead whoever it was. Arrhidaeus’ disability was inconvenient but the thought of there being no king – or that the crown might pass to a non-Argead was inconceivable. Alexander’s most senior Friends and Bodyguards met to discuss the phalanx’s decision. Unsurprisingly, they decided to reject the choice of Arrhidaeus. They knew that a disabled king was, in a sense, twice as dangerous as an able-bodied one. If the latter made a bad decision, he alone was responsible – and could be made to answer – for it (keep Perdiccas in mind for an example of this). A disabled king like Arrhidaeus, however, was not only capable of making bad decisions but might be forced to do so by other people who would then hide behind his authority in order to avoid being called to account. Having rejected Arrhidaeus, the Friends and Bodyguards decided to bring the phalanx to heel. To ensure that this happened, they formed an alliance with the Companion Cavalry. A senior office named Meleager was sent to the phalanx to order it to submit. What followed was the first of many turns and treacheries that would take place over the next forty years and, indeed, bring the Wars of the Diadochi to a close when Ptolemy Keraunos assassinated Seleucus. … for the resolution that they had taken and sharpened their anger against their opponents. As a reward for this, the phalanx made Meleager its leader and ‘advanced under arms’ against the senior officers. Had the latter remained in Babylon, perhaps they would all have been killed and the bloodshed that followed avoided. But Meleager’s betrayal had been discovered and the men fled from the city. … the most important of the Friends and of the Bodyguard should take over the satrapies and obey the king and Perdiccas. In his Who’s Who in the Age of Alexander the Great Waldemar Heckel explains which Successors were in the first and second rank at Babylon. Had Antipater and Craterus been present they would undoubtedly have been in the first rank; I am not so sure about Antigonus. Did their absence matter? And who got where? We’ll find out in the next post.